Description: Take command of the stars! 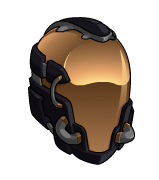 This all-black helm is exclusive to those who mine the metal-rich asteroids. J6 says "thank you" for helping him get one step closer to his dream of visiting space! Thanks to Mira and Ninjahakk.